Mariner Software on Thursday released Mariner Calc for the iPhone, giving users the ability to work with spreadsheets on the iPhone. 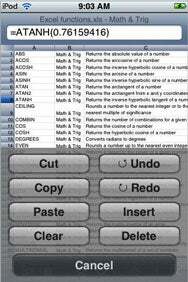 On the iPhone, Mariner Calc gives you the ability to view and edit native Excel files (Excel 97 and up). You can also wirelessly transfer to and from your computer. 14 lookup functions plus logic, date, text and info functions. Mariner Calc is available for $9.99 from the App Store.